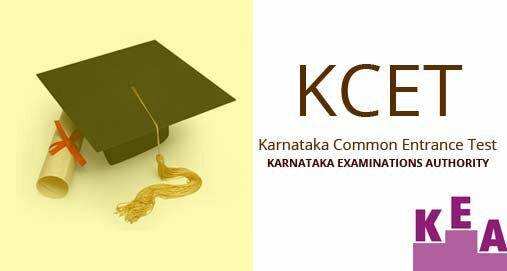 The Common Entrance Test, also known as KCET will be conducted by Karnataka Examinations Authority from 2nd May to 4th May. On 4th May, the Kannada Language Test will be conducted for Gadinadu and Horanadu candidates. KCET happens to be the entrance test which is held with an eye to determining merit for seeking admission to different professional courses such as architecture, medical, health sciences, engineering, agriculture, pharmacy, veterinary science, animal husbandry, etc. KCET is held for seeking admission in First Semester/ First year of different full-time courses in different institutes in the state of Karnataka. Students can fill the Application form for the entrance test online only. The entrance test will be conducted across different examination centers in Karnataka state. There is specific syllabus and pattern for examination for each subject for Karnataka CET. Admission is accomplished on the basis of scored marks, preference of branch and college. Meeting the eligibility criteria and verification of documents are recognized to be an integral part of admission in colleges via the entrance test of KCET. KCET is conducted over a time period of two days in four sessions. On the first day, Mathematics and Biology papers are held. On the second day, Chemistry and Physics papers are conducted. The last date of submitting the KCET application online for the test is 27th February. The Biology and Mathematics test will be holding on the 2nd of May while the date for the Physics and Chemistry test has been fixed on the 3rd of May. Results of the test will be announced on the last week of May. Counselling will start tentatively on the second week of June in the year. To appear in KCET examination, candidates should have passed higher secondary/ 2nd PUC or equivalent examination from a recognized board with Mathematics and Physics as compulsory subjects. Candidates from the general community should have scored a minimum aggregate score of 45% in Mathematics, physics and any one of the subjects like Chemistry/ Biology/ Biotechnology/ computer/Electronics. Candidates belonging to the SC and ST communities should have secured a minimum score of 40% in aggregate for these subjects. Candidates seeking admission to Architecture courses should qualify the NATA examination. Candidates seeking admission to the Pharmacy courses should have passed the higher secondary or equivalent examination with Physics, Chemistry, Mathematics/ Biology as well as English as a language subject. Candidates from the general and reserved category should have scored a minimum aggregate of 50 % and 40% in science group, respectively. Engineering & Technology : The candidates should have passed 12th with 45% marks in PCM (40% for reserved categories). Medical/Dental/Other : The applicant should have passed 12th with min. 50% marks in PCB with English (40% for reserved categories). Architecture : The applicant should have passed 12th with min. 50% marks with Mathematics (45% for reserved categories). B.Sc (forestry & Agri.) & B.HSc : The candidates should have passed 12th with PCB. B.Tech (Agri.) : The candidates should have passed 12th passed with PCM. B.Pharma : The candidates should have passed have 45% marks in PCM or PCB or D.Pharma (40% for reserved categories). The University has released the application form on the website of the university from 27th January and the last date to file the application form online will be 27th February. There is no provision to submit the application form through the offline mode. While filling the application form, candidates will require uploading their photograph as well as their left-hand thumb impression and signature in a format prescribed by the university. This KCET examination will be conducted through the offline mode and candidates will require answering objective type question. The question paper will be having 3 sections, each section for Physics, Chemistry and Biology, each section having 60 questions. Candidates will be given a span of 80 minutes to answer the questions from all. The KCET syllabus will be majorly based on the syllabus for the 1st and 2nd PUC as prescribed by the Pr-University education of the department of the state. Syllabus for the engineering test will include topics from Physics, Chemistry, and Mathematics. The syllabus for the Pharmacy entrance test will be covering topics from Physics, chemistry, as well as Biology. Admit card for KCET will be conferred from third of the month of April. Students can download the admit card for the year via online mode. The admit card contains Name, Category, Roll Number of the candidate, Exam Centre Venue along with the date and timing of the test. Candidates can download the admission ticket from the official website kea.kar.nic.in. It is a must to bring the admit card on the date of the test along with valid identity card. Karnataka Examinations Authority will release the results of KCET. The results will be declared in the month of May. You can view the results of KCET on the official website of Karnataka Examinations Authority. Registration details will be required for viewing the results of the entrance test. After the declaration of the result, students require verifying their documents. After this, they can apply for admission in different colleges under Karnataka Examinations Authority. The seat allotment to the different courses in accordance with the seat matrix will be accomplished online after procuring options from eligible candidates on the basis of rank secured in the year and options provided by candidates. The University will be publishing the result of the examination by the 4th week of May. Candidates can check their result from the website of the University and at the time checking the results, they will have to produce their registration number. The KCET Result will be declared by the KEA in the last week of May. Candidates will be required to enter their registration number on the official site to view results. Candidates are advised to take printouts of the result and keep it safe till the admission procedure. Counselling for KCET will start from the second week of the month of June. Candidates will receive an invitation for counselling process on the basis of their performance in the entrance test. It is mandatory for the candidates to report for verification of documents along with original documents on the scheduled date, declared by the authority. The seat allotment will be accomplished on the basis of rank secured by the candidates, availability of seats and filled choices. If the student is not happy with the allotment of seat, they can participate in the next counselling rounds. KCET brings a list of different colleges and institutes which will provide admission to eligible students into different engineering courses in Karnataka State. The list of colleges will play an integral role in KCET counselling. The participating colleges of KCET are inclusive of University colleges, State Government Colleges, Government Aided Private colleges and Private Unaided colleges. The Participating institutes will be allocating seats in accordance with the rank obtained in the entrance test of KCET. Sri Jayachamarajendra College of Engineering. Sri Taralabalu Jagadguru Institute of Technology. College of Engg. and Tech. S D M Institute of Tech. Can I know the exam pattern for KCET ? The KCET examination will be held in 2 days 1st day Biology and Mathematics 2nd day Physics and Chemistry. Total marks for KCET paper will be for 60 marks each for 80 minutes. And the time duration of each paper is 80 minutes for KCET.